With CD of Performances and Play-Along Backing Tracks. Composed by Hans-Guenter Heumann. Sheet music with CD. Edition Schott. Classical Instruction. Softcover with CD. 104 pages. Schott Music #ED13382. Published by Schott Music (HL.49019146). ISBN 1847612512. 9x12 inches. Hans-Gunter Heumann With CD of Performances and Play-Along Backing Tracks. 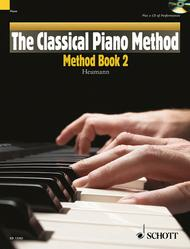 Repertoire in Method Book 2 includes extracts and themes from: The Magic Flute (Mozart) • Waltz (Diabelli) • William Tell Overture (Rossini) • German Dance (Beethoven) • Swan Lake (Tchaikovsky) • The Blue Danube (Strauss) • Humming Song (Schumann) • Piano Sonata in A Major (Elgar) • The Moldau (Smetana) • Carmen (Bizet) • Piano Concerto No. 21 (Mozart) • Für Elise (Beethoven) • Prelude in C Major (Bach). Excellent material for self learning or learning with a teacher. Very well played cd as a bonus.